.New Zealand wines are such a staple of our wine merchant’s shelves - or our own modest cellars - it’s a shock to discover that, until the 1970s, the wines were barely known outside the country. Since then, however - particularly with the discovery that the Marlborough region was superbly qualified to grow the sauvignon blanc grape - New Zealand has become synonymous with quality wines. 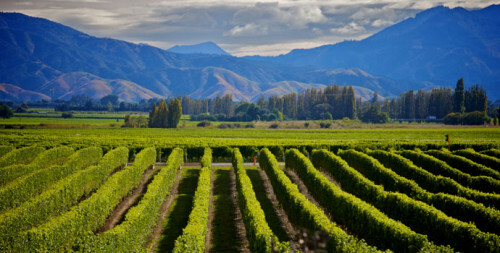 Home of the country’s most famous wine - sauvignon blanc - Marlborough, at the north of South Island, is also New Zealand’s biggest wine-producing region. Dry and sunny, its most popular area is around Blenheim and Wairau valley. This means, when looking for a New Zealand wine hotel, you can choose either to be based in the city or the country. 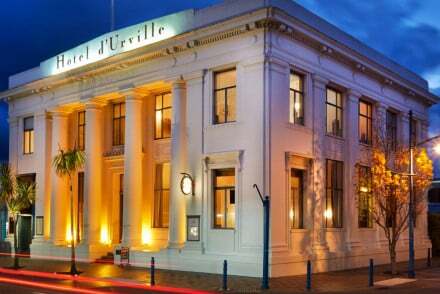 For an urban base, Hotel d’Urville in the heart of Blenheim is a smart choice. The art deco, boutique hotel has just 11 stylish rooms, individually themed from colonial to vintage to retro; some with four-poster beds. Great cocktail bar, too. If you prefer to be deep in the vineyards, Lake Timara Lodge is a luxurious alternative. With English-country-house styling - antiques, window seats, elegant drapes - it sits in a five-acre, rose-filled garden with outdoor pool, tennis court and, of course, a private wine cellar. The tiny region of Nelson, at the northern tip of South Island, is a distinct, self-contained area cut off from neighbouring regions on three sides by mountains and, on the fourth side, by the magical Tasman Bay. Hence it has a very distinct micro-climate, well-suited to growing aromatic grapes such as Riesling and Gewurztraminer. 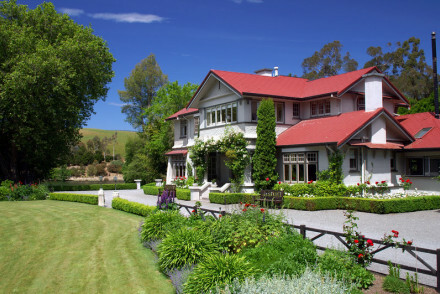 Food-lovers will be charmed by A Culinary Experience, a boutique B&B just outside the city of Nelson. Gourmet breakfasts, cooking classes and wine tours are some of the attractions while its two luxury suites have balconies overlooking Tasman Bay. Even closer to Tasman Bay, on Nelson’s waterfront, Wakefield Quay House has a huge veranda, perfect for sundowners. The 1905 villa has two large and elegant, light-filled rooms, with antiques, original art and modern bathrooms. 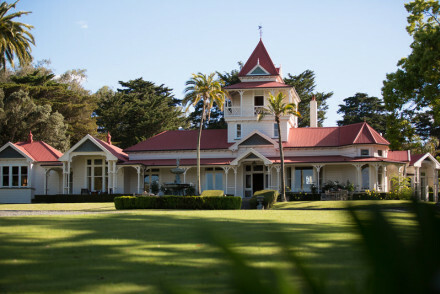 On North Island’s east coast, Hawke's Bay is New Zealand’s second-largest wine-producing region, particularly known for its Bordeaux-blend wines. Here are some of the country’s oldest vineyards, originally planted by missionaries for sacramental wines. Similarly, Greenhill Lodge, although surrounded by farmland, is far from country-basic. This lavish lodge offers roll-top baths (some on private terraces), open fires, antiques, large beds and fresh flowers - as well as a pool, gym and turreted look-out tower. Very romantic. Found, not surprisingly, in the north of North Island, the vineyards of Northland are predominantly around the Bay of Islands and on the west coast near Kaitaia. This means that many of our New Zealand wine hotels in this area make for a great beach holiday, too. Northland’s wine production is modest but the region can lay claim to having New Zealand’s oldest vines, planted in 1819. Syrah and Pinotage are the dominant grape varieties. 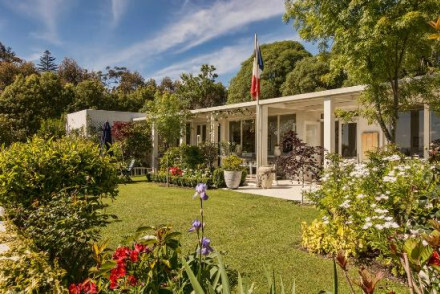 In the village of Kerikeri, Bed of Roses is a charming B&B with French country-style bedrooms, private terraces and a luscious garden. Extensive breakfasts will set you up for a day exploring the vineyards; the hosts will arrange wine tours. 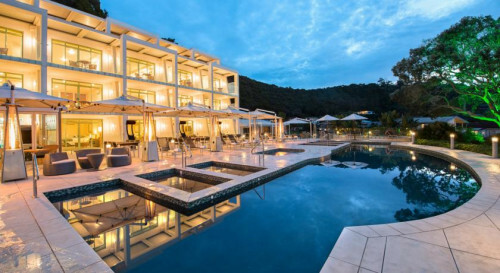 If you want to combine wine-tasting with sunbathing, take a look at Paihia Beach Resort, a stone’s throw from one of the Bay’s prettiest beaches. Light, contemporary style bedrooms have balconies plus there’s a spa and fishing trips on offer. Auckland in North Island may be best known as New Zealand’s largest city but it is also a wine-producing region in its own right with vineyards - growing mainly chardonnay and Bordeaux varieties - within easy striking distance of its centre. 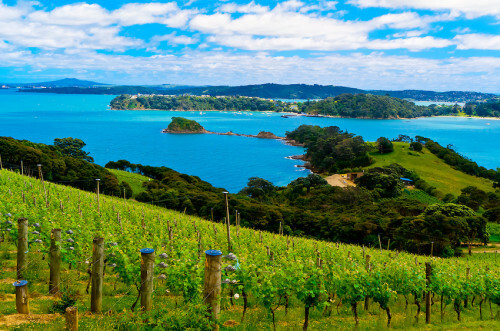 Some of its most famous vineyards are on Waiheke Island in the Hauraki Gulf, a small, hilly island with an engaging population of hippies and artists. Much of the area’s grape harvest is used by boutique wineries. You can’t get much closer to the vineyards than at Dellows Waiheke. Within walking distance of eight wineries, including its own boutique operation, Dellows offers simple, bright self-catering accommodation, all with private terraces. If you’d prefer someone else to do the cooking, Te Whau lodge is a smart, modern, chalet-style affair, close to both beach and wineries, with lots of natural woods, glass and expansive views. We have plenty of wine hotel choices in Auckland, if you’d rather be city-based. 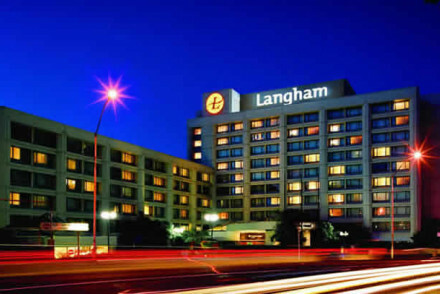 The Langham Auckland is a slick, luxurious affair, close but not too close to the waterfront, with spacious, exotically styled bedrooms and marble bathrooms plus an outdoor pool and spa. Tucked between the Marlborough region to the north and Central Otago to the south, Canterbury spreads around the city of Christchurch on the east coast of South Island. With its cooler climate, it is particularly known for elegant, balanced wines made from pinot noir, chardonnay and Riesling grapes. The sheltered Waipara valley, in particular, is famed for its Riesling vineyards. Between Christchurch and Waipara Valley, Stoneleigh Lodge is set in 20 acres of grounds which, entertainingly, include an alpaca farm. Wonderfully private, with just two very large and elegant suites, there’s also an indoor heated pool. If you’d rather have an urban base, The George is a crisp and stylish affair in the heart of Christchurch. Rooms are light and comfortably minimalist and there’s a choice of two award-winning restaurants. New Zealand may be a small country - not much bigger than the UK - but it packs in a huge amount of variety of both landscape and wines. Use our guide to the best wine hotels in New Zealand to discover this surprising little country for yourself. 1920s art deco style boutique hotel in Blenheim with 11 stylish and unique rooms, each with individual themes from classic to retro. Four poster beds, original art works and free wifi. Great restaurant and cocktail bar. 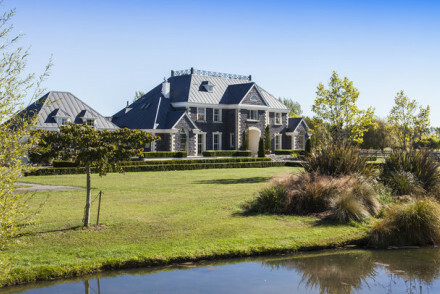 An ideal base for exploring the Marlborough wineries. Luxury lodge with English country house feel in the heart of NZ's Marlborough wine region. Rooms with antique furnishings, bright wall paper, comfy double beds and seating areas. With a swimming pool, 5 acre garden with deliciously scented roses, tennis court and private wine cellar. Just charming. 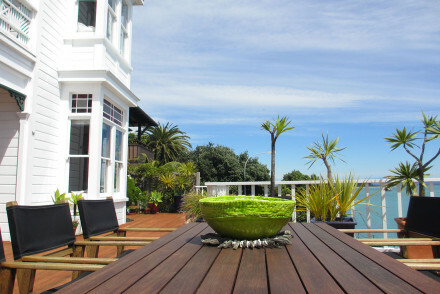 Boutique B&B outside Nelson with two large, light and luxurious suites adorned with original art. Hot tub, private wine cellar, private verandas and large garden to relax in. Gourmet breakfast, cooking classes and wine tours available. Close to beaches and great walks in Abel Tasman National Park. 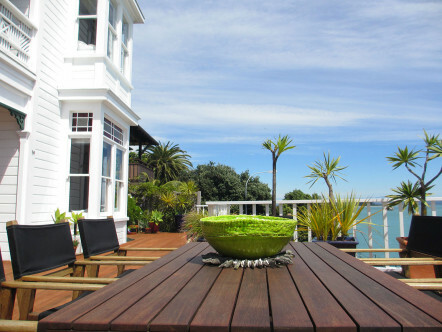 Luxury B&B in 1905 historic villa on Nelson's waterfront with glorious views over Tasman Bay. Two tasteful, elegant and spacious ensuite rooms with antiques and original artworks. 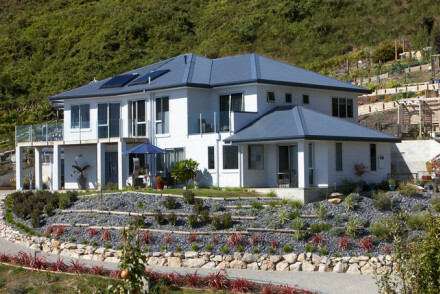 Close to Abel Tasman National Park, wineries and within walking distance of restaurants. Great for a weekend break. Charming luxury accommodation in the heart of 6000 acre sheep farm. Rooms are rustic and elegant, with top modern amenities and fantastic sea and farm views. Great walking, riding and mountain biking tracks on property, as well as bird life. Family friendly rural retreat. High-end Lodge on 73 acres of lush farmland. Charming antique-filled rooms with open fireplaces, large double beds, private terraces and free-standing baths. With an outdoor swimming pool, gym and three storey viewing turret. Perfect for a romantic getaway. 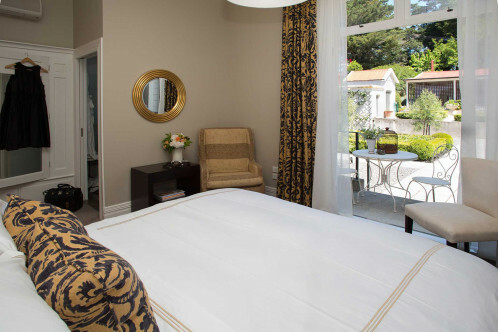 Luxury B&B with three French-themed suites. Double beds, antique furnishings and glorious colourful garden. Extensive breakfast menu and all dietary requirements catered for. In quaint village with views to river basin. Wine tasting and championship golf courses close by. 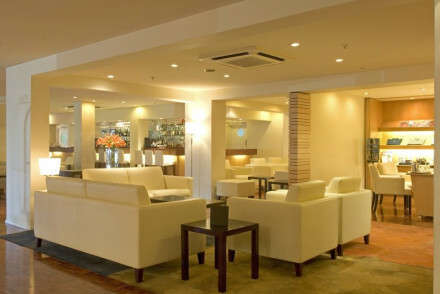 Luxury hotel with light, clean and spacious suites with features such as French oak floors and large balconies. 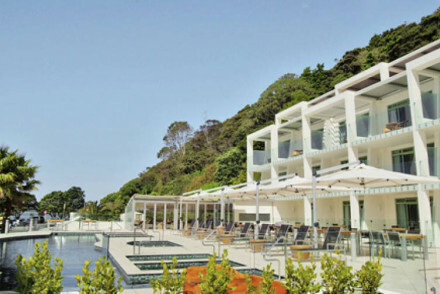 Only metres from Paihia's most picturesque beach, completed with spa, swimming pool and restaurant serving seasonal food. Ideal for tours of Bay of Islands, golfing and fishing trips. 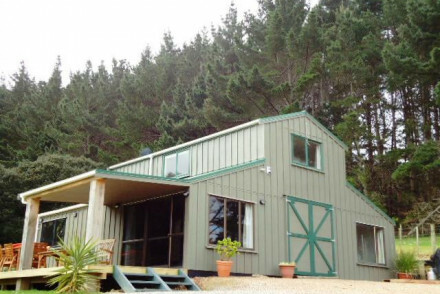 Self-contained accommodation set on eight acres in the heart of Waiheke Island's wine region. Rooms elegant and comfortable, with private outdoor terraces. 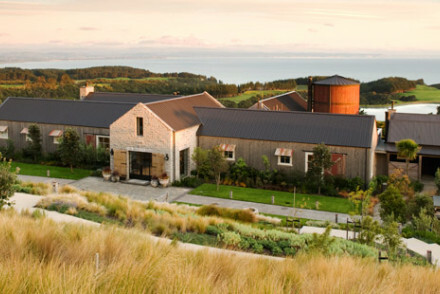 Has its own boutique winery and distillery, and ten minute walk to Onetangi Beach. Great for families and groups. 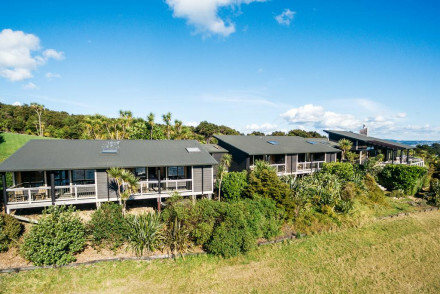 Contemporary boutique lodge with panoramic views across Putiki Bay, and access to a private beach. Rooms are modern, elegant, light and spacious and all have a private deck with table and chairs. Fresh breakfast from ingredients grown in garden. Close to wineries, beaches and great walks. Rooms are large and decadently decorated with rich colours and with marble bathrooms. A gym, outdoor heated salt swimming pool and spa, every luxury. Within walking distance to Auckland waterfront and CBD. An urban chic hotel. Two suites in a luxury lodge set in 20 acres of landscaped grounds with three lakes and a working alpaca farm. Rooms, large and light with modern amenities. Use of an indoor heated pool during winter, and close to wineries, skiing and whale spotting destination. Ideal for an action packed holiday. 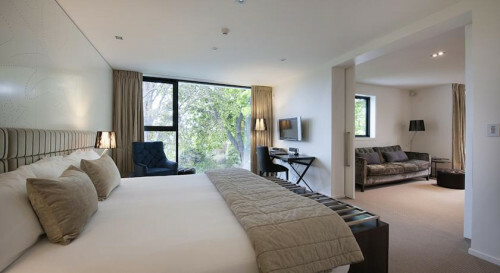 Small luxury boutique hotel in centre of Christchurch. Local art on walls, top amenities and great views from rooms out to Hagley Park or River Avon. Two award winning restaurants, access to a gym and free use of mountain bikes. City style done well.